It was the wee hours of the night and the streets of Paris were silent and still. Soft lights illuminated every empty street and bridge. Some friends and I rode our bicycles through this magical city, though I lagged behind, entranced by the idea that for this brief time, Paris was my playground, and mine only. 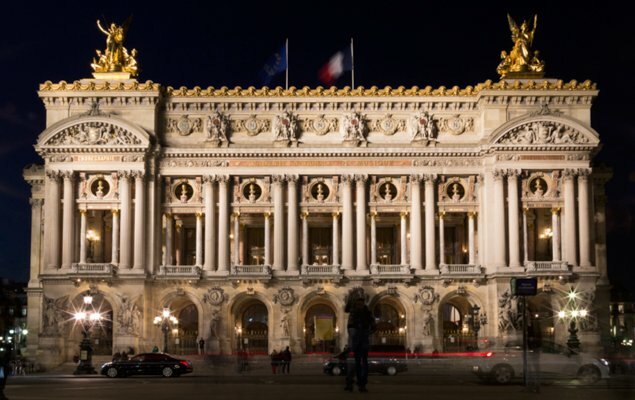 I’ll never forget the moment when we rode past the Palais Garnier fully lit up in all of its glory—it stopped me in my tracks and took my breath away. 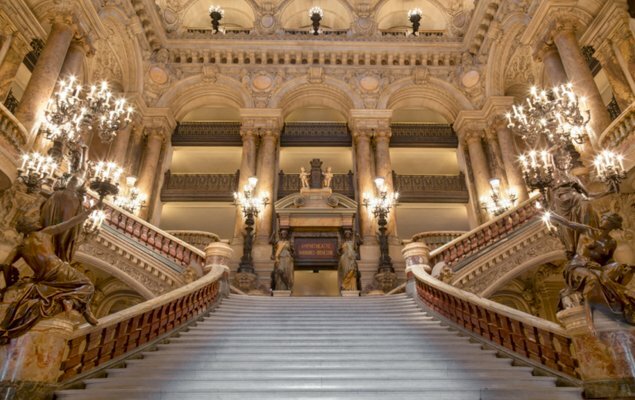 Now, some six years later, I returned to the Palais Garnier with sufficient time to explore and appreciate it. It was everything I dreamed of, and more. 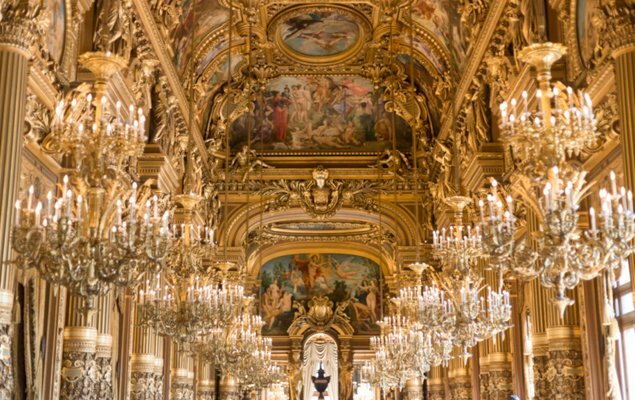 Historically known as Opéra de Paris or Opéra Garnier, the building was designed in the Beaux Arts style, commissioned by Napoleon III. After 14 years of construction it was opened in 1875. 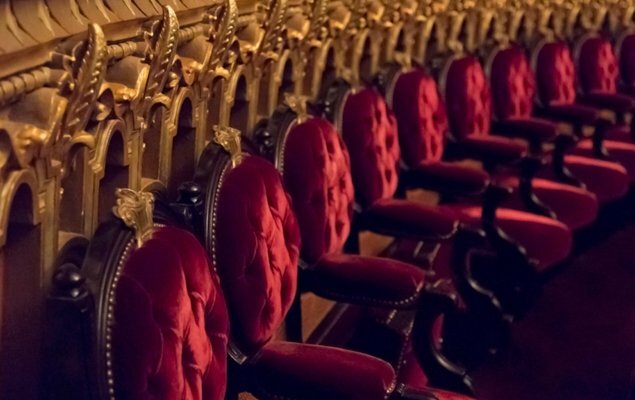 It is one of the most famous opera houses in the world, and its stage is the largest in Europe. 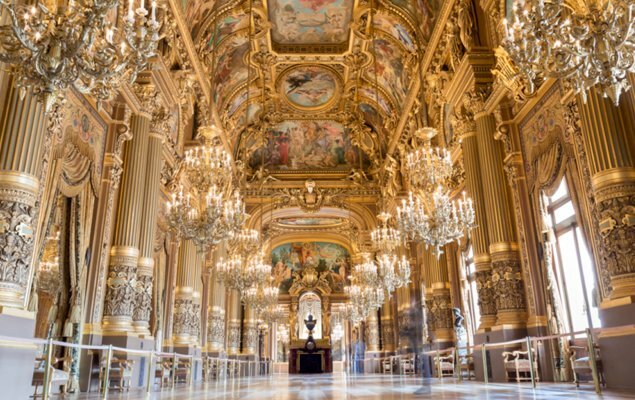 I learned that for a fee of 11€ one can gain access to tour inside the Palais Garnier any day of the week, while at night the Paris Ballet performs on stage to an audience of nearly 2,000. I had no idea this was open to the public and I was stunned that I had never heard of it. I don’t know what I was expecting but upon my entrance, I couldn’t have been more overwhelmed with surprise—I visited for two days in a row because I was so taken by it. Around every single corner a world of sparkling chandeliers and ornate golden details revealed themselves to me and I found myself quietly giggling with amazement. The interior could be described as opulent, but the artistry is undeniable as well as the thoughtful symmetry throughout. It’s quite intentional that the interweaving stairwells, alcoves and landings allow patrons to mingle and people-watch, for coming here to see and be seen was once something of much significance. One of the most impressive features, the Grand Staircase, extends almost a hundred feet high and is made of marble in white, green, red and black. 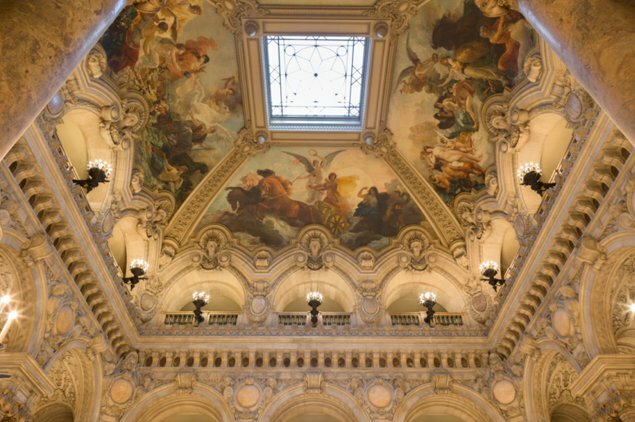 It is topped by stunning ceiling paintings of allegories in music. The Grand Foyer is another grandiose sight, reminiscent of (though even more decadent than) the Hall of Mirrors in the Palace of Versailles. The space is 500 feet long, lined from one end to the other with glamorous chandeliers. 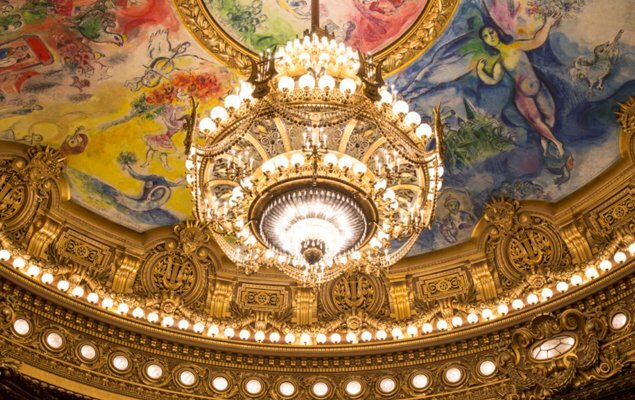 The striking ceiling frescos by Paul Baudry depict moments in the history of music, and these alone could absorb your entire afternoon. 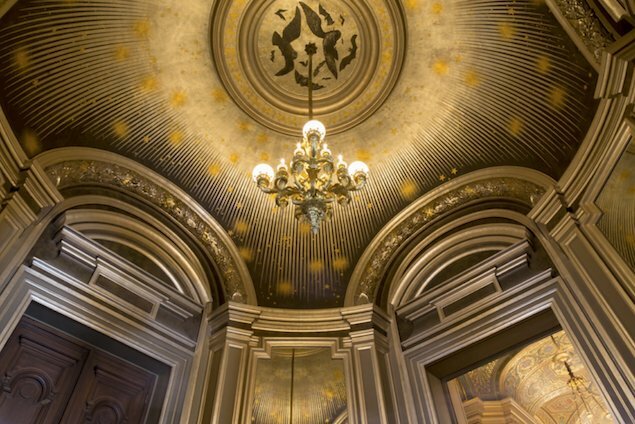 The hallways around the main foyer are adorned with shimmering mosaic ceilings, the first use of Venetian mosaics outside of Italy. The bronze and crystal chandelier in the Auditorium is famous for it’s size (weighing 7 tons) and inspired a scene from Phantom of the Opera. It’s quite iconic, though personally I was drawn to the Chagall ceiling fresco above the chandelier, painted in 1964. 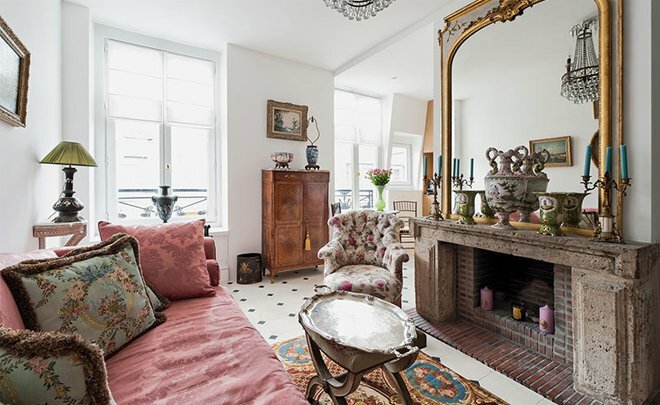 It depicts scenes from 14 famous operas and has a whimsical feeling about it, quite dissimilar to the rest of the décor. Peeking down hallways and around corners, I explored several other spaces including rotundas each with a unique theme and décor. These round rooms were originally private areas to entertain the Paris elite. Two of my favorites, though lesser known, are small rotundas dedicated to the sun and moon; the Salon of the Sun has a dome adorned with a golden sun burst and mirrored walls, while the Salon of the Moon dome is adorned with silver moon rays and other starry night sky details in both gold and silver leaf. The mirrors facing each other on each wall create dizzying, infinite reflections. 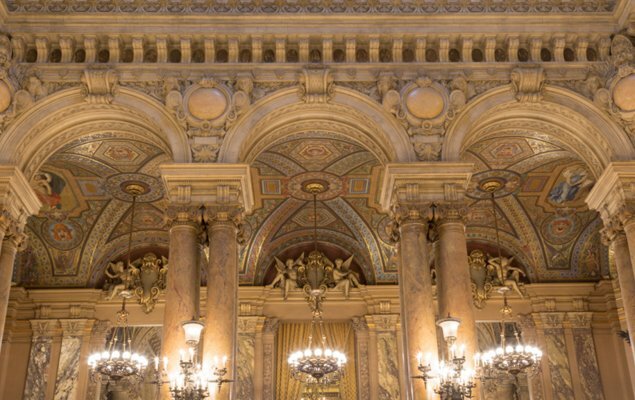 I hope you get a chance to be even half as surprised and mesmerized by the Palais Garnier as I was, and may you find excitement and inspiration everywhere your wanderlust carries you. 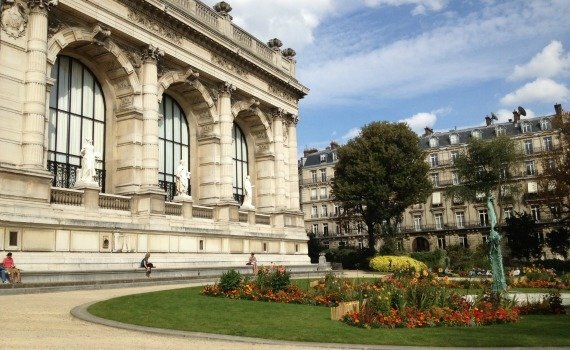 NEXT: Welcome to 25 Place Dauphine – the Finest New Address in Paris! Posted on Friday, May 6th, 2016 at 8:00 pm in See & Do. You can follow any responses to this entry through the RSS 2.0 feed. You can leave a response, or trackback from your own site.